April 6, 2012 1 comment on "Taco Seasoning Mix Recipe"
Taco seasoning mix is really easy to make at home. You probably already have on hand everything you need to make it. Not only does this easy taco seasoning mix taste better, it is less expensive and doesn’t have any additives or preservatives that are bothersome to so many people. 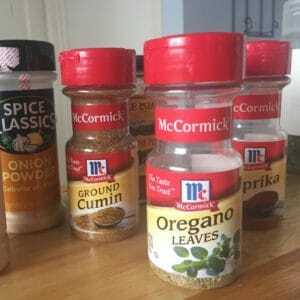 This homemade mix is a great alternative to McCormick’s taco seasoning mix. Mix all the ingredients together in a small bowl. This recipe makes the equivalent of one store-bought taco seasoning packet. You can just make this copycat taco seasoning as you use it, or you can make up a bunch at a time and store it in these really convenient small glass storage jars you can get from Amazon. They are great for storing all your spices and mixes. If you make up a bunch of this seasoning mix at one time, then use 3 tbsp. of the seasoning mix to mix with your ground beef. To use the mix, add the seasoning mix and 3/4 c. water to 1 lb. browned ground beef or turkey. Simmer for about 5 minutes, or until liquid is mostly absorbed and mixture has thickened. Prepare tacos as usual. 1 Comment on "Taco Seasoning Mix Recipe"
Made your taco seasoning tonight. My husband says it’s better than the Ortega taco seasoning. Thanks for a great recipe!